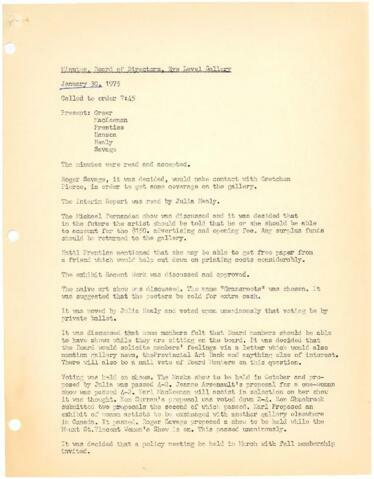 Item is a typed set of minutes from a meeting the Eye Level Gallery Board of Directors held on January 30, 1975. Members present included John Greer, Karl MacKeeman, Hatti Prentiss, Joyce Hanson, Julia Healy and Roger Savage. The meeting was mainly regarding future exhibition work at the gallery space. Michael Fernandes' show was discussed in terms that the artist would account for the $150 advertising and opening fee. Board members should also have the possibility of having an exhibition at the Eye Level when they are a member of the Board. The members voted on seven potential shows to have at the gallery, which included shows by Jeanne Arsenault, Karl McKeeman, Ken Curran, Ron Shuebrook, and Roger Savage. It was decided that a letter was to be sent to Mary Kenny requesting her to fulfil her obligations as a board member, a later decision would be made regarding her resignation. Minutes of the meeting were types on acidic paper.